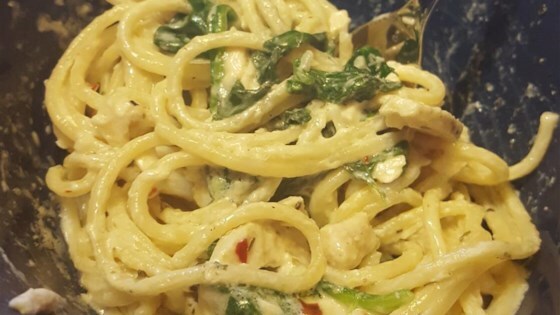 "This is my spin on Alfredo sauce. We love cream cheese, mushrooms and garlic. So I decided to try different ways of creating this tasty dish! Serve with fettuccini, and sliced crusty bread for mopping!" Heat 2 tablespoons of butter in a skillet over medium heat. Stir in the mushrooms; cook and stir until softened, about 5 minutes. Set aside. Meanwhile, melt the cream cheese and 1/2 cup of butter in a saucepan over medium heat, stirring occasionally. Stir in the milk and Parmesan cheese, mixing until smooth. Add in the garlic, basil, and white pepper. Simmer for 5 minutes, then remove the garlic. Stir in the cooked mushrooms before serving. Classic creamy and cheesy Alfredo sauce. Yum! I pretty much followed the recipe, that was awesome. It was good and easy!! I used garlic powder, dried basil and 1/2 of the butter and it turn out great.